No African-American employees in the Federal Horticultural Board. In reply to your memorandum of even date, I hasten to state that there are no colored employees in the Federal Horticultural Board. 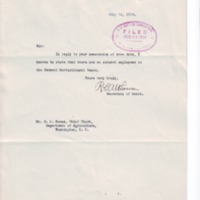 Althouse, R. C., “RC Althouse to RM Reese,” 1914 July 14, A082414, Race and Segregation Collection, Woodrow Wilson Presidential Library & Museum, Staunton, Virginia.